Welcome to the Here Comes Baby Giveaway Event! Let's just say, I have babies on my mind! With less then 2 months to go, for the arrival of my little boy, I am really in my nesting mode again. I've been grabbing deals everywhere, and looking for the newest, and best things. So partnering up for a baby themed giveaway event, was just all me! I had to! 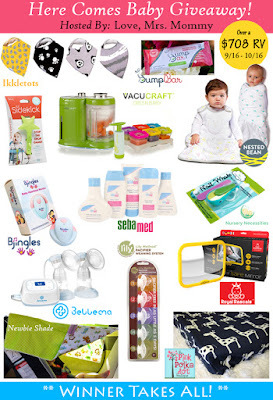 Here is a little bit about the great prizes, and sponsors (All of the following reviews and product write ups, are from Love, Mrs. Mommy. "Nested Bean was formed with a purpose of helping parents care for their newborns with intuitive, medically backed, and the safest products. The Zen Swaddle and Zen Sack incorporates TouchSense technology. TouchSense technology imparts a calming pressure (like a mother resting her hand on their baby's chest), by using lightly weighted areas. This triggers a self-soothing response in the nervous system. Such a technique is proven to help regulate stress by stabilizing heart rate, blood pressure and reducing levels of cortisol. Winner has their pick of either a Zen Swaddle or Zen Sack in their choice of size, up to a $44.99 RV! BumpBar is an obstetrician formulated pregnancy nutrition bar. It’s non-gmo, certified gluten-free, vegan, preservative free and contains folic acid, calcium, and iron! A healthy way to get the nutrients you need for both you and your baby. Winner will receive a 4-pack of BumpBars, a $16.99 RV!" Check out my review here! Giveaway is open To US only - You must be 18 years of age, or older to enter. This giveaway will end on October 16, 2016. Disclosure: Love, Mrs. Mommy and all participating bloggers are not held responsible for sponsors who do not fulfill their prize obligations. Love, Mrs. Mommy received free product and/or nominal compensation to facilitate the above-mentioned reviews. This giveaway is in no way endorsed or sponsored by Facebook or any other social media site. The winner will be randomly drawn by Giveaway Tools and will be notified by email. The winner has 48 hours to reply before a new winner will be drawn. If you would like to participate in an event like this please contact LoveMrsMommy (at) gmail (dot) com. Lil' Blog and More received no compensation, in exchange for this post.